. ki 木, jumoku 樹 trees of Japan .
. shinboku 神木 Sacred tree, "Tree of a Deity" .
. madogi 窓木 "window tree" .
. enoki 榎 nettletree, Chinese hackberry tree .
. gingko 銀杏 Gingko biloba .
. katsura 桂 Japanese Judas tree, Cercidiphyllum japonicum .
. keyaki 欅　/ けやき / ケヤキ 伝説 Legends about the Zelkova tree .
. kunugi 櫟 Quercus acutissima ー oak .
. kuwa 桑 mulberry tree and kaiko 蚕 silk worms .
. kusu no ki 楠木 camphor tree .
. matsu 松 pine tree .
. nashi 梨の木 Japanese pear .
. sakaki 榊 と伝説 Legends about the Sakaki tree . This is the sacred tree of Japanese Shinto, Cleyera japonica.
. Heike Ochudo densetsu　平家落人伝説 legends about Heike Ochudo .
. sugi 杉 cedar tree, cryptomeria . ----- Tengusugi, Tengu-sugi　天狗杉 Tengu Cedar Tree. ----- . sakasa sugi 逆さ杉 / 逆杉 upside-down cedar tree .
. yanagi 柳 willow tree . - - - - - . - daija, orochi 大蛇 the huge serpent, great snake - . One of the islands of Mizushima 水島諸島, near Kurashiki. On the island there is a valley called "Yanagi no tani 柳の谷", valley of the willow tree. There was a time when a huge willow tree grew there, hence the name. The tree was so huge that the ships coming in to the harbour could see it from afar and adjust their journey to it. So it helped to keep the local waterways quite safe. In the nearby village there lived a beautiful girl called O-Ryu, who liked the tree very much. Every day she went to it, praised it and stroke its huge trunk. The tree liked her visit and always stroke her back gently with its huge branches. It was during the construction of a special large temple hall in Kyoto, the Sanjusan Gendo 三十三間堂, when everyone was looking for trees huge enough to support the heavy roof. Eventually a white arrow, sign of being chosen for the building, was stuck into the tree. When the news spread, O-Ryu was all in tears and could not be consoled. Then one day woodcutters came to the island and whacked their huge ax into the stem of the tree. The tree shook in pain - and O-Ryu, who stood nearby, also felt a pain as if a knife was stuck into her body. 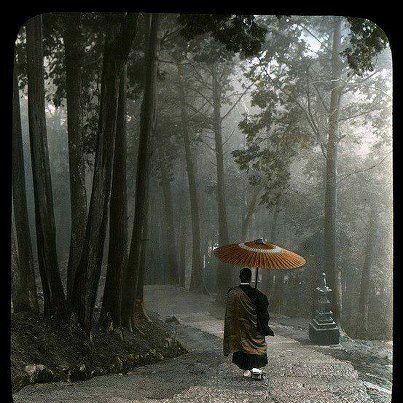 Every time the woodcutters whacked at the tree, O-Ryu was hit by pain. Finally the tree was felled and they tried to pull the heavy stem to the beach for transport by sea. But however many strong men pulled at the ropes, the stem would not move one bit. O-Ryu went back to the Valley of the Willow tree, hugged the stem and bid it good bye. Then she sat on it - and oh wonder - the tree slid down to the beach with no further ado. The stem was shipped to Kyoto and is now a roof beam 棟木 of the famous Sanjusan Gendo Hall. In Mie prefecture there is a another story about a huge willow tree for the Sanjusan Gendo Hall. The roof beams for the hall had to be about 100 meters long and were not so easy to get. A huge willow tree of the village had to be felled and brought to Kyoto for the Sanjusan Gendo Hall, which was built on request of 後白河上皇 /後白河天皇 Go-Shirakawa Tenno (1127-1192). He had a severe headache all the time and wanted to construct a large temple to pray for healing. Once the temple was built, the Emperor's headache was healed. 頭痛山平癒寺 "The temple which heales Headaches". The present-day temple building dates back to 1411. In a former life 後白河法皇 Emperor Goshirakawa had been a mountain priest named 蓮華坊 Renge-Bo, but he had fallen into a ravine and lost his life. A willow tree grew on the spot, piercing the skull and causing the Emperor a constant headache whenever the wind blew the branches of the tree. On a pilgrimage to Kumano to get rid of the headache, the Emperor learned of his former life and made a search for the skull. He buried the skull properly and used the willow tree to make a beam of the Sanjusan Gendo hall 柳で三十三間堂の棟木. 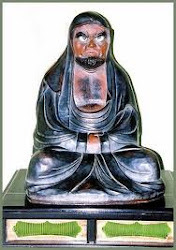 Other versions say he had a Statue of Kannon made and placed the skull inside to show this greatfulness for being relieves of the headache.
. ooyakazu 大矢数 "shooting many arrows" . The temple complex suffered a fire in 1249 and only the main hall was rebuilt in 1266. 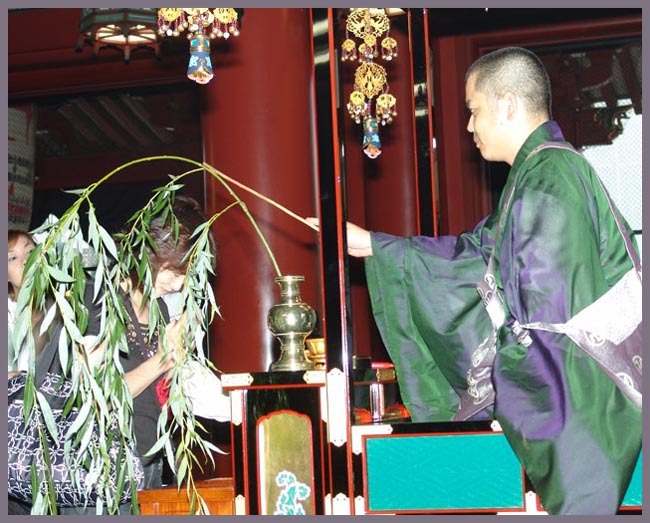 In January, the temple has an event known as the Rite of the Willow (柳枝のお加持), where worshippers are touched on the head with a sacred willow branch to cure and prevent headaches. 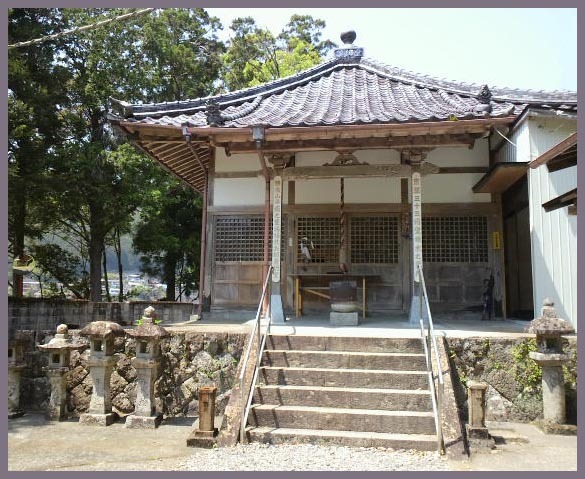 A popular archery tournament known as the Tōshiya (通し矢) has also been held here, beside the West veranda, since the Edo period. About one thousand years ago (but according to the dates of the story 744 years ago) the temple of 'Sanjusangen Do' was founded. That was in 1132. 'Sanjusangen Do' means hall of thirty-three spaces; and there are said to be over 33,333 figures of the Goddess Kwannon, the Goddess of Mercy, in the temple today. There lived in the village a young farmer named Heitaro, a great favourite, who had lived near the old tree all his days, as his forefathers had done; and he was greatly against cutting it down. And is thus far budding well? Heave ho, heave ho, pull hard, my lads. Yoi, Yoi, yoi to na. Is it not good, good, good? A third 'Uta' sprang from this story, and is often applied to small children helping.
. sennen bikuni 千年比丘尼 a young nun for 1000 years . Often she planted a walking stick in the temple compound before leaving, which sprouted to live on . . There was also an old tree, byakushin ビャクシン / 柏槙 (a kind of mountain juniper) to our day, which had sprouted from her walking stick.